Let’s talk about curved SkyDeck™ grid panels. First of all, what comes to mind when you hear the word “grid”? Personally, I think of graph paper with the faint blue lines evenly spaced vertically and horizontally to form little squares across a page. Lots of angles. Comforting predictability. Typical SkyDeck™ grid panels are 4’ x 4’ square frames with wire rope woven on 2” centers to form the wire mesh walking surface. Neat rows of perfectly tensioned cable housed within perfectly square frames. Look at this! 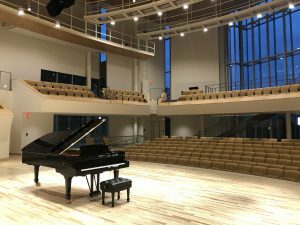 This is Penn State’s new recital hall. Isn’t it beautiful? This was a project long in the making. Planning began in 2011. The design team was finalized in 2015. Design and in-depth collaboration kicked off at the beginning of 2016. Construction started in 2017. 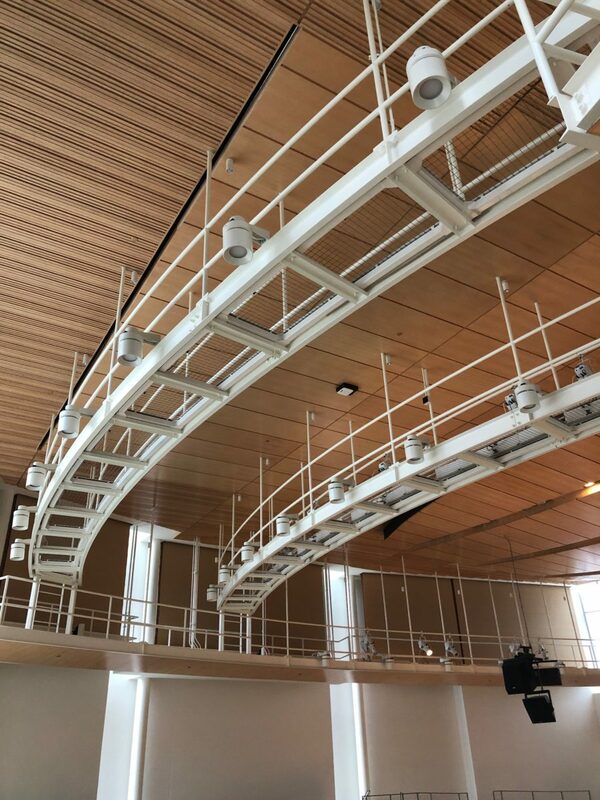 The project was completed in October 2018, resulting in a brand new 400 seat recital hall and a complete overhaul of the existing space (Esber Recital Hall) into much needed rehearsal space.Did you notice the catwalks at the top of the picture, sweeping from left to right? Folks, those are curved SkyDeck™ grid panels. Not faceted panels sitting inside the catwalk frame. The panels themselves are curved. You can see them a bit more clearly in the next photo. As these grid panels were manufactured in our shop here in Sanford, FL, I sought out Pat Taulbee, IA Stage’s Shop Foreman, to learn what all goes into creating a curved SkyDeck™ grid panel. “How did you make these?” I asked. “There is an art to fabrication,” Pat told me earnestly. Then he walked me over to the A-FAB 472 Hydraulic Angle Roll machine.Pat explained that he creates a template with the appropriate radius out of scrap steel and uses that as a guide. Then he showed me how 8’ lengths of 2” x 4” steel tube are gently rolled to achieve the required curves. (I say gently, but this machine can bend 6” I-beams.) And then he told me about stringing the curved SkyDeck™ grid panels.He wasn’t kidding about the art of fabrication. Stringing a square grid panel with wire rope woven at 2” centers is one thing. It’s a completely different animal when the frame is curved. You can’t just machine the holes 2” apart on curved framing members and expect the holes to line up. They won’t. The exact placement needed to create that 2” x 2” wire mesh was generated by the designer/draftsman of the panels. In this case, that was Greg Fecher, the same guy who drew the giant SkyDecks at the LA Forum and Little Caesars Arena in Detroit. Once Greg had all the details worked out on paper, Pat and his crew brought the design to life in steel.And who would have thought that steel and aircraft cable could look so elegant?